Our Ultra-High Heated and Homogenized cow long life milk is available in Full Cream (Whole Milk), Skimmed and Semi-Skimmed Milk. Also, we’ve recently added falavoured milk to our Long life milk collection. The product carries the freshness and wholesome taste of fresh milk with the added long shelf-life value. We currently pack our UHT Milk and long life flavoured milk in various size Tetra Paks and Plastic Bottles. Our all new 200ml flavoured milk comes in various flavours: Banana Milk, Strawberry Milk, Chocolate Milk, and Vanilla Flavoured milk. This is a long-life shelf item for kids and adult milk drinkers. Dana’s best-seller standard slim 1-liter tetra pak is the right choice for any size family who enjoy the fresh and natural taste of milk and care for a healthy and wholesome nutritional diet. 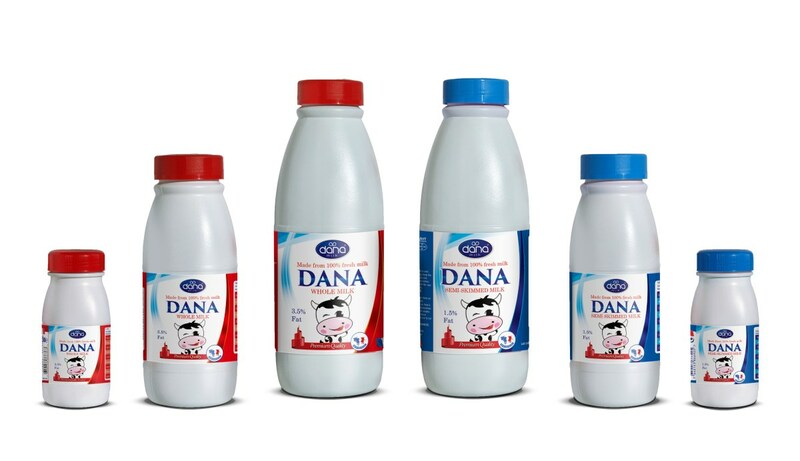 The same great tasting DANA long-life milk that we have, is now available in beautifully designed plastic bottles (HDPE). These are great personal – carry to work and school – items for everyone. Pure cow’s milk processed in Ultra High Temperature carries the pure-homogenous, full taste of milk. The UHT process gives milk long life. 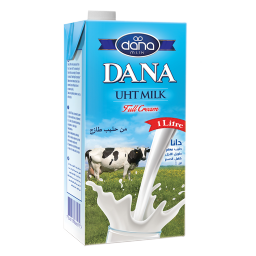 Dana’s UHT milk comes in Full Cream (Whole), Semi-Skimmed, and Skimmed types and is ultrahigh heated, homogenized and packaged in Tetra Paks for extra long life and easy storage. The same fresh and pure taste of milk that comes with Dana’s long life milk in Tetra paks, also comes in beautifully designed plastic bottles or HDPEs. Plastic bottles are wonderful and easy-to-carry containers for today’s busy men and women. The design of the label is also aimed at encouraging younger children to drink milk. 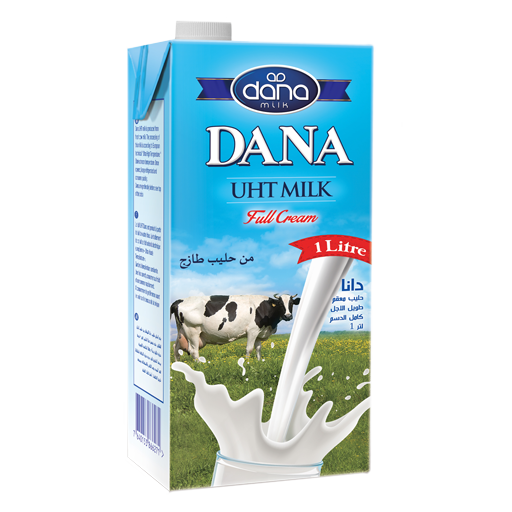 The same way, Dana’s UHT milk in bottles is produced and packed according to European dairy industry standards. The milk comes in three variations of skimmed, semi-skimmed, and full cream milk (whole milk). Contact us to see how we can help with your next upcoming requirement. 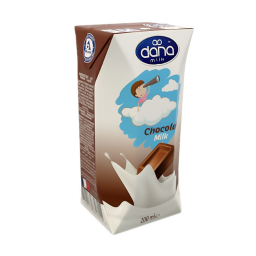 Our Dana products are produced and processed according to European technical standards for “Ultra High Temperature” milk production. The process allows for the long-life characteristic of the milk while the package is not opened and it is stored at normal room temperature. Once the package is opened, the product should be kept refrigerated at all times and should be consumed as quickly as possible. DANA Long Life Milk now comes in flavourful 200ml packages. Milk has never been so flavourful. Our flavoured milk packs come in great and attractive variations your customers will love. Strawberry Milk, Chocolate Milk, Banana Milk, and Vanilla milk. This is beside the original and natural DANA long life milk in 200ml packs. 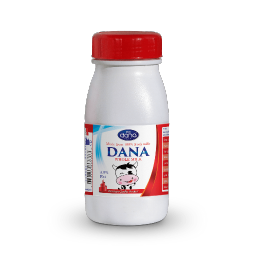 Dana’s full cream milk or whole milk contains the natural fat content of the milk without any being removed. This is usually 3.5% of the total weight of the milk. Full cream milk brings with itself the natural and wholesome taste of cow’s milk along with its smooth texture and feel. 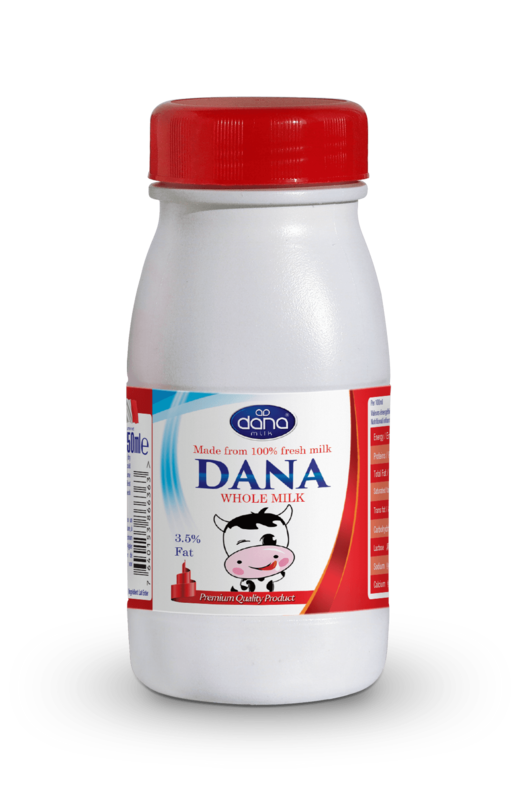 Dana’s Skimmed Milk retains only a minimum of the original fat content of cow’s milk which is 0.5% of the total weight of the product. Dana’s skimmed milk is a great way of keeping the original taste and natural flavor of the milk while doing away with major part of milk’s fat content. Meeting the requirement of the adult milk drinkers with both the need to control fat intake as well as the desire to keep the taste and flavor of the true milk, our semi-skimmed milk contains only 1.5% fat with more than half of the milk’s natural fat being removed. The Ultra-High Temperature processing brings you a long lasting shelf item. Our UHT long life milk helps facilitate an extended period of time for storage of the product while it is being distributed through your market channels. The same UHT processing that gives Dana’s long shelf life also enables you to store the product at normal room temperature. This brings a very economical way to store the product while you are moving it through your distribution channels. 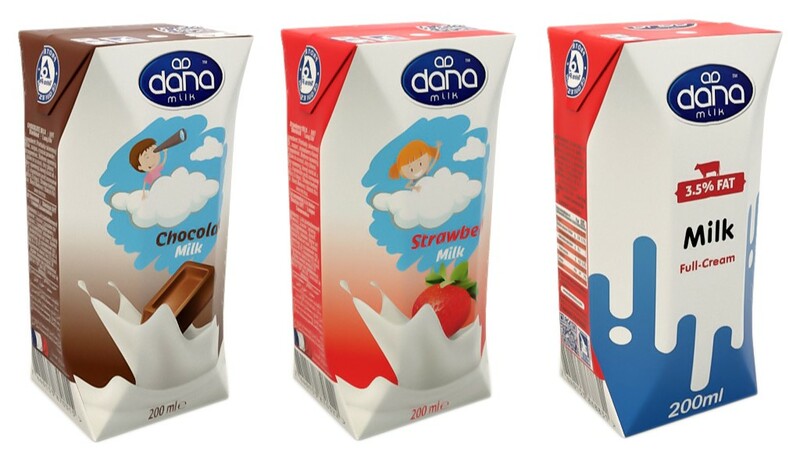 Dana’s UHT Milk tetra paks or plastic bottles bring extra advantage to your product in the market. 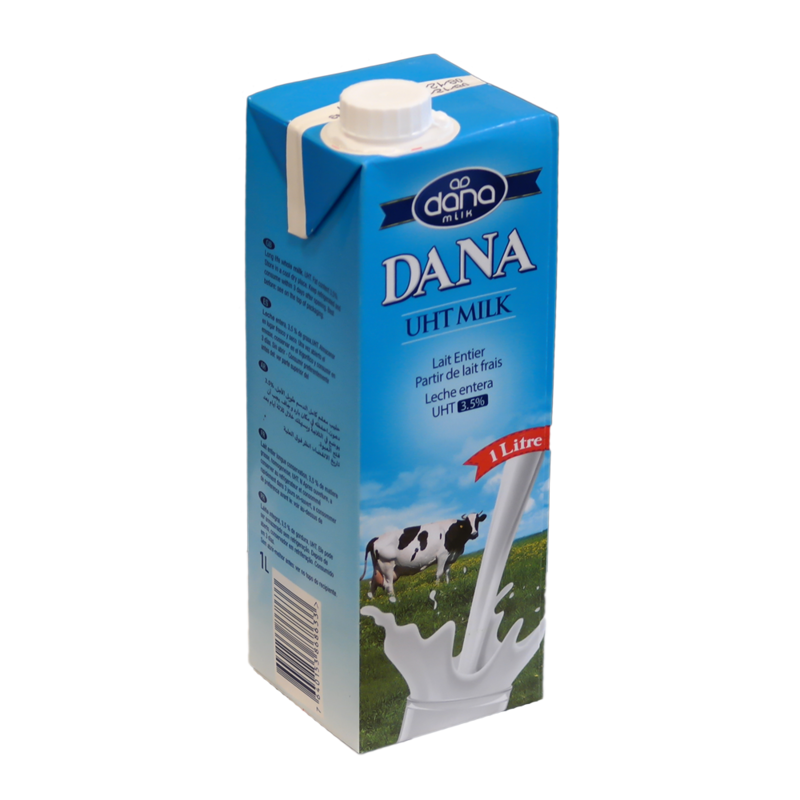 The design makes it easy for your consumers to enjoy the refreshing taste of Dana milk and easily refrigerate the leftover.